There are a lot of things to remember when you're pregnant or a new mom - like how your baby grows during pregnancy and signs your baby is ready for solid food. Text4Baby makes it easy to get this important information - and it's FREE! Text4Baby sends personalized messages directly to you, timed to your due date or your baby's birth date - and the texts have information you can trust, since it is developed by experts all over the country. 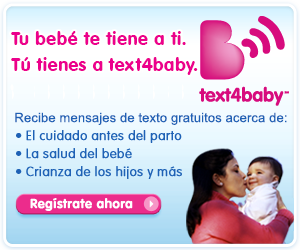 To sign up, Text BABY (or BEBE for Español) to 511411 or download the Text4Baby app in the app store. 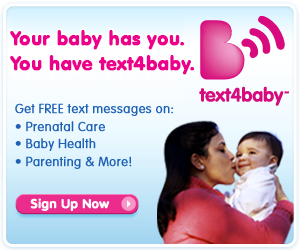 Once you are signed up, you can also use Text4Baby to send yourself FREE appointment reminders. Simply text REMIND (or CITA for Español) to 511411 and enter your appointment date and time. Text4Baby messages do not include any advertising or spam, and you can cancel at any time (just text STOP to 511411). Text HELP to 511411 for technical help at any time, or UPDATE to change your due date or baby's birth date.